Owner says sell! Make an offer for this incredible Viking 58 Enclosed Bridge. 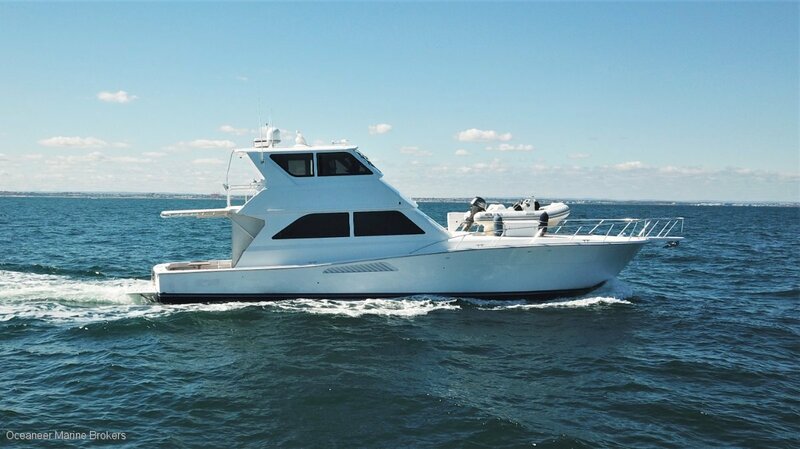 Oceaneer Marine Brokers is proud to present this exceptional Viking Yachts, "Miss Chief. " Viking Yachts are world leaders in custom manufacturing of performance sport fishing and luxury cruising motor yachts. Stepping aboard the 1999-launched 58 footer, you instantly appreciate the volume of this highly specified flybridge cruiser. Spacious teak laid cockpit with 2 x fridges and cooktop, open plan saloon, dinette and galley well furnished with plenty of cooking, fridge and freezer space. Three cabin/three bathroom model, with master suite to port, VIP cabin forward and bunks to starboard. The build quality and strength of the Viking hull develops incredible seakeeping ability which is especially noticed upstairs when cruising at 30 knots. Yes cruising at 30 knots! The twin Caterpillar 3412 engines running at 1350HP a side will push this 58 footer out to a very impressive 36 knot sprint speed. Both engines have been rebuilt and are currently running in perfect condition. Also fitted with twin Cummins Onan gensets equipped with "autostart" system. This vessel is being sold in 100% operational order with negotiable terms and conditions involving share options, moorings at Rottnest Island, moorings at Abrolhos Islands and more! Please contact Oceaneer Marine on (08) 9243 6373 or email sales@oceaneermarine. Com. Au today for further details. accomodationImpressive three by three layout, master suite to port, VIP V-berth, 2 single bunks in crew cabin. 2 ensuites and a day head. Both lounge suites in saloon and flybridge have a large ottoman insert which create sizable double beds.